The public tide of sympathy for dairy farmers has pushed the supermarkets to act again, this time, with “drought relief” milk. It’s the latest incarnation of what DIAA scholar Norman Repacholi rightly calls “welfare milk”. I cannot tell you how grateful I am to everyone who is pushing the supermarkets to do better. But this just can’t go on. The so-called “drought relief” of 10 cents will reach few of us but all of us are affected by skyrocketing feed prices and need to pass some costs on. Only, we can’t. Despite the special $3.30 for 3 litre milk that will be promoted for three months or so, most homebrand milk will remain priced at $1 per litre. Those are 1992 prices. If milk had kept pace with inflation, it would today sell for $1.80 per litre. Now, it’s true that fresh white milk sold through supermarkets does not account for a big percentage of the milk produced by most Victorian dairy farms. Some will tap their noses wisely and say that it doesn’t really matter a hell of a lot. But it does, even to a farm like mine whose milk is turned into infant formula. It matters because it demonstrates perfectly how terribly captive Australian dairy farming is and how much reform is badly needed. I can’t imagine any other Australian who would put up with all their blood, sweat and tears being discounted to 1992 prices. Yet we do, and that culture permeates the way prices are set for all of our milk. It’s time to banish the begging bowls and get Australian dairy farming back on its feet. 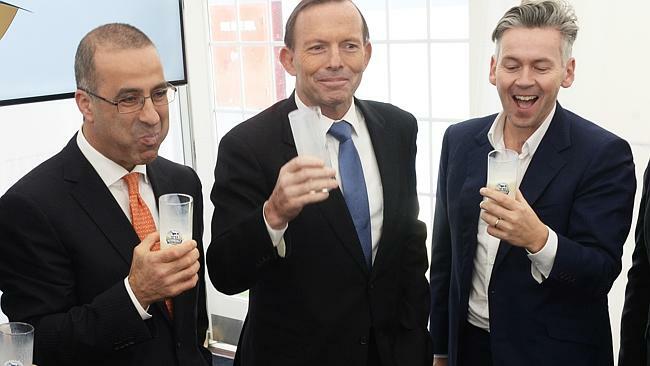 Three men in suits – a prime minister, supermarket supremo and the MD of a dairy processor – stood drinking glasses of frothy cold milk on the steps of the first MG Co-op factory dedicated to supplying fresh Devondale-branded and private label milk to Coles. Beneath the froth, however, doubt among the very dairy farmers sponsoring the opening celebrations continues to simmer and bubble. Ever since the Coles deal was announced, there have been skeptics. Plenty question whether it is possible to make money supplying milk that retails at a dollar a litre and the concept alone that milk could be priced cheaper than water offends many dairy farmers. All that gloom follows the journalist’s derisory comments about the Sydney factory being at least one month late, $30 million over budget and the trigger for contractual penalties that can only be imagined. And, yes, when the deal was announced, MG’s farmer shareholders were promised the factories would cost “just” $120 million. MG now puts that figure at $160 million, hinting at a cost blow-out of staggering proportions. To top it all off, Coles ads pimping our cherished, premium Devondale-branded milk at just 75 cents per litre sent shockwaves through the Australian dairy community on Twitter yesterday. Q. What are the actual costs of the two factories? A. Following our initial cost estimates for the two factories we decided to invest in additional capability and capacity to maximise efficiencies through automation and layout. This brought the total investment in our Melbourne and Sydney facilities to approximately $160 million. This provided for future operational cost savings. Q. Has MG been unable to supply milk to Coles on time? Q. If so, what are the penalties? A. This is a contractual matter between MG and Coles. Q. Does MG have adequate raw milk supply for the Sydney factory now? A. In New South Wales, we have already sourced more than 180 million litres of milk. This is more than enough to cover our initial requirements of approximately 100 million litres per annum in this market and allows for future growth. Q. When do you expect the Sydney facility to be supplying milk Coles with its full requirement of milk? A. The site is being commissioned through July with production scheduled to commence early August, reaching full capacity by the end of August. Q. When will the investment break even? A. Both sites are forecast to add positively to MG’s farmgate price from year 1. If the Murray Goulburn deal with Coles can withstand a 33% cost-overrun and Coles’ penalties while adding to the milk price from year one, this must be an extraordinarily lucrative contract indeed. Who would have thought the Down, Down, Down folks could be so generous? While you’re chewing that over, take a minute to look at the new Devondale ads via my fellow dairy blogger Lynne Strong, who tells me her post discussing the commercials has gone viral attracting around 1500 views in 24 hours. MG cannot be accused of being boring! These days, I feel a little like a chess piece; more pawn than queen. The Australian federal government has rushed into a free trade agreement with Japan that does next-to-nothing to help Aussie dairy break through tariff barriers, even though Japan is hardly known for a growing dairy industry of its own that deserves protection. I don’t know why we were overlooked but a Sydney Morning Herald story quotes Warren Truss as citing “compromises”. It’s been an interesting few days for dairy. Coincidentally, the ACCC forced supermarket superpower, Coles, to confess that it was lying when it claimed the $1 milk had not hurt dairy farmers. At the same time, the media is littered with references to milk as “white gold” and so on, while our co-op, Murray Goulburn, contemplates a partial sell-off to raise capital. And the milk maid? Yes, I’ve almost recovered financially from last year now but not emotionally. A Kiwi who’s now dairy farming here in Victoria tells me that one of the differences he’s noticed is that there’s just not the “buzz” around our farmers in a good year that you get in NZ. Here in Australia, the dairy sector contributes $13 billion to our economy but that’s considered small fry, accounting for less than 1% of our GDP, which totalled $1451.1 billion in 2011–12. If we are to realise our potential, we need a government that helps dairy grow rather than considering it as a tradeable concession. All eyes are now on the FTA negotiations with China. Plenty of people have discussed why this presentation was in such bad taste. Callous, even. But the part that really caught my attention was the role of our co-op, Murray Goulburn, in Hadler’s “case study”. The gloating Hadler describes the deal with Murray Goulburn as “The game changer”. Hadler’s right about this but not in the way he means, I suspect. The Hadler case study goes to show just one thing: no matter how Coles tried to spin $1 milk, Australians knew it stank and none of their ads, infographics or appearances by Curtis Stone could fix it. Until, finally, Coles actually did something to address the damage caused by the milk war: an unprecedented 10-year deal that was too good for the co-op to refuse. Now that’s not a case study in spin, Mr Hadler, that’s a case study in people power. PS: If you would like to keep up the pressure for Coles to do the right thing, add your voice to this petition by Queensland ag teacher, Lisa Claessen, who was compelled act after her students became casualties of the ColesWorths milk war. I never thought I’d say this but some of my milk will be sold on Coles’ shelves in both homebrand and Devondale cartons from next year. And I’m pleased. You see, the co-op we supply, Murray Goulburn, is a giant too. It processes around 35 per cent of Australia’s milk and earns $1.17 billion in exports, making MG one of the largest container exporters from the Port of Melbourne. In other words, it doesn’t have to sell to Coles and Woolies, giving it much greater leverage with the supermarket duopoly. It also has the scale needed to be an efficient processor. Most importantly, its number one goal as a 100% farmer owned co-op is to maintain the profitability of its farmers. All the same, it is confronting when “our” co-op does a deal with the devil. Has it sold out on us? The thing is, while Murray Goulburn exports around half of its milk, reducing our reliance on the supermarkets, that exposure to international commodity prices and the exchange rate can be painful, too. International commodity prices rise and fall like a cork in a bottle and the average Aussie dairy farmer loses about $9,000 (according to my back of the envelope sums) with every cent the Australian dollar rises against the US dollar. Of course, it’s at record highs right now and not looking like falling below parity any time soon. The uncertainty that comes with that volatility makes it very hard for farmers to attract finance and invest with confidence in their businesses. On the other hand, I wondered why Murray Goulburn could make a profitable $1 milk deal with Coles when Lion, the company currently processing Coles’ homebrand milk, cannot. Jon Hauser thinks it’s largely an issue of supply chain efficiency. “Leaving aside the aberration of $1.00 discount milk, branded milk retails at about $1.60 per litre and supermarket private label at about $1.20 per litre,” Hauser says. “Farmers are getting 25 – 35 % of the consumer dollar. In the UK and the US farmer share is closer to 50%. Direct supply by a farmer co-op removes the middleman that is adding cost in marketing and collecting additional value from their brands. “It is true that the supermarkets will become ‘the brand’ but the farmer co-op should also able to retrieve some of this value. In the case of the Coles/MG deal, MG will get part of that return from the ranging of their own Devondale brand. “What is most critical in maintaining a balance of commercial power is the ability of farmers to sell their milk to a range of alternate customers. Murray Goulburn has the diversity of product and markets to do that and can now genuinely claim that they have a balanced portfolio of domestic and export sales”. It all sounds very positive for existing Victorian Murray Goulburn dairy farmers like me. But what about for farmers near Sydney, who have been supplying Lion and Parmalat and who traditionally get so much more for their milk than we do yet depend almost exclusively on supermarkets? “This all adds up to change. 6. A risk for the milk vendors as the processing sector changes. The reality is, though, that there will be losers. Commenting on the future of the current processor of Coles’ milk, Lion, prominent NSW dairy farmer, Lynne Strong (@CHDairies) said on Twitter that “They have lost QLD plus NSW Coles contracts Cant see them surviving this one #sadbutrue”. Lion is almost certainly not going to be the only loser in what all agree will be massive upheaval in New South Wales. But there will be winners and maybe, just maybe, represented by an increasingly powerful co-operative, dairy farmers will claw back a little dignity. And you, dear milk drinker, will soon be able to buy 100 per cent farmer-owned fresh milk knowing that all the profits stay right here in Australia. Devondale (Murray Goulburn Co-operative Co. Limited), the Australian farmer Co-operative, today announced a landmark, ten-year partnership to supply Coles with daily pasteurised milk for its private label brands in Victoria and NSW from July 2014. Separately, the Co-operative will also relaunch Devondale-branded daily pasteurised milk, through an initially exclusive agreement with Coles, and Devondale cheese will return to Coles’ shelves. contains rise and fall provisions to protect the premium farmers receive. As a Co-operative, Devondale will return 100% of the profits from this agreement to its farmer-shareholders through higher farm-gate returns. Devondale Managing Director, Gary Helou, commented, “The daily pasteurised milk segment is currently mainly supplied by foreign owned companies that repatriate their profits to overseas shareholders. The entry of Australia’s farmer owned Co-operative into this market segment cuts out the middle man and delivers profits directly to farmers. “MG expects to receive returns that represent a premium over and above the price available in other markets such as commodity dairy ingredients. The contract is expected to lock in this premium for ten years, regardless of what is happening in international dairy markets or movements in the Australian currency. All profits on this contract will be returned to all supplier-shareholders through improved farmgate returns. This new revenue stream will also reduce volatility by providing an additional domestic earnings stream as a balance to fluctuating export earnings. Will have more on this for you later today. A clever vet student, Cassandra MacDonald, from NSW has created this fabulous infographic to set the record straight. It’s only five minutes (don’t worry, the 13 minutes on the YouTube counter is wrong) but wow, does she pack a punch! Watch this space for more to come about this remarkable young woman. “It is undeniable that Central & Northern NSW and Queensland milk production has dropped dramatically in the past two years. “It is also undeniable that the southern exporting states are seeing no such effect – this is despite seeing a downturn in the global dairy industry over the last year. “Stop and think what you are doing Colesworths. You have taken a very blunt axe to the Australian dairy supply chain. In our view you are definitely in denial if you think that you and your shareholders have no responsibility for the long term social health and economic wealth of Australian agriculture.